The JUNO Awards came to you live from Regina on Sunday. 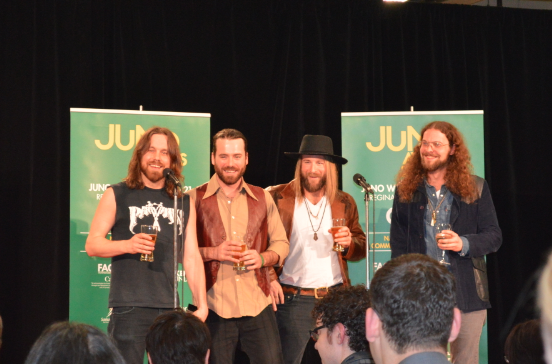 Rider Nation was well represented and the kings of the province, The Sheepdogs, made multiple appearances. 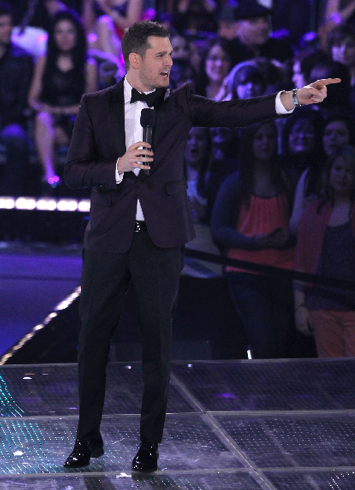 The show was hosted by Canadian crooner Michael Buble and performances were made by Serena Ryder, The Sheepdogs, Carly Rae Jepsen, The Tenors, Marianas Trench, Michael Buble, Billy Talent, Classified and David Myles, Hannah Georgas, Metric and k.d. Lang. So, the big question is, how did Michael do? Fans, press, haters all judge your every move, every joke and every segue. Did he pass the test? Michael told the press that he thought he did the best he could and he was happy with his showing. Now we deconstruct. He started out with an opening video with some of his famous friends, former host Russell Peters, Kelly Ripa, Dr. Phil and a clip from a Gerard Butler movie. You started off right away thinking…Michael Buble is so legit, he is friends with Dr. Phil and got Kelly to sing Celine Dion. Then he got the in-house audience with some jokes about the Rough Riders, which they ate up like candy. For hosting duties I thought he was above par. The weird little One Direction intro and interaction was very awkward, but other than that I think he was pretty standard lovable Michael. I can’t judge him for things that are beyond his control such as the audio during both of his songs, that was horrifying. Speaking of One Direction, thank God there was someone ‘there’ for the tweens to freak out over because Justin Bieber was noticeably absent. He didn’t even have a video for his Fan Choice win and we all know how he likes to give shout outs to his fans. Carly Rae in the press room post double win. 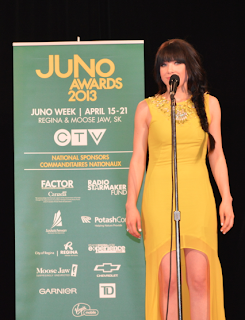 The Bieber protégé, Carly Rae Jepesen, won the top honors tonight with Album of the Year and Single of the Year. The year of Call Me Maybe is now officially over. How will she ever top the success of that song? I asked her after she got her award and she said that she is going to try, but it is very apparent to her that it is going to be tough. Realistic. Love her. 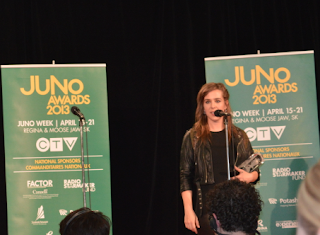 Alternative Album of the Year went to Serena Ryder’s Harmony. Very well deserved. Ryder is a vocal powerhouse who will have a illustrious career. I would bet money on it, if that was a thing you could bet money on. Songwriter of the Year went to Leonard Cohen. Obviously legendary and a safe bet to go with at any award show. His son Adam accepted his award on his behalf because Cohen is currently on tour. The two that were surprises to me were Breakthrough Group and Group of the Year. Maybe I am not in the know with what is going on in the ‘band’ universe, but I was shocked that Mariana’s Trench took home Group over The Sheepdogs and Metric…jaw dropping shocked. I am writing this a day later and I still think my face is numb. Breakthrough Group went to Monster Truck who, in their defense and mine, I have never heard before. I was sure it was going to go to Hey Ocean! or YouTube sensations Walk Off the Earth…I will blame this surprise to ignorance. As previously stated, there was some jenky things going on with Michael Buble’s audio during his performance, but I thought he made out OK. The show stealer was obviously k.d. Lang. So brilliant. There was such a diverse range of artists that I can’t really pick out my favourite. None were particularly horrible. I am not really fond of Billy Talent or Mariana’s Trench, but to each their own. All in all it was good hosting, legit winners, some fantastic performances and very little complaining from me....what the hell is going on here? And believe me, it is not because I am in a good mood after driving 7 hours from Regina today. Next year the JUNOs will be in Winnipeg. Thank God they got the Jets back so that host will have some material to run with. I thought it was icky when Buble started going on about how it would be okay if some young thing's shorts were crumpled up on his bedroom floor .... and then they cut to his wife pretending to be mad.